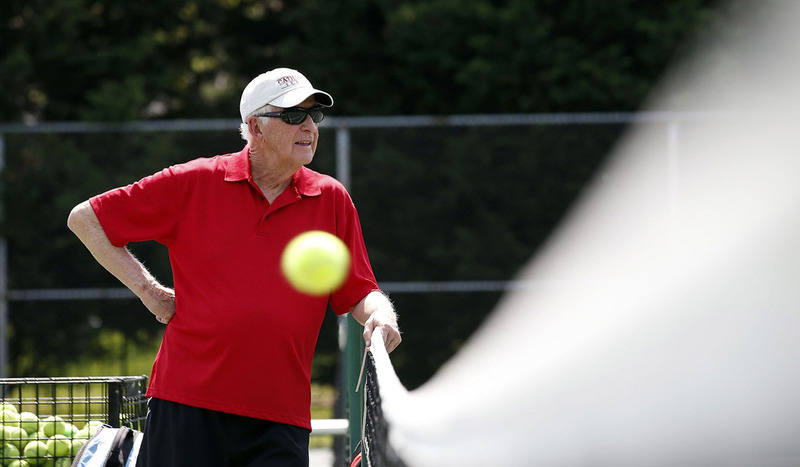 Marty Dowd, for the better part of 60 years, was synonymous with men's tennis at Catholic University. He played here four seasons, was an assistant coach for one and head coach for 53. His coaching tenure is among the longest in NCAA history. While directing the program from 1962-2015, Dowd won 60 percent of the more than 900 matches he coached. His 562 victories included 44 winning seasons. He retired a year after leading the Cardinals to the NCAA Tournament. But to think of Dowd solely in terms of athletic accomplishments would leave the canvas of his life woefully incomplete. "Looking back on my days playing for Marty, I've come to realize that he was really much more than a coach," said Doug Eby, a 1981 Catholic graduate and Hall of Famer. "His mentoring, which extended well off the court, made me a better person. I'll always be grateful to him." Eby is among the more than 500 players Dowd coached. "He taught me a lot of valuable life lessons and tips on how to treat people," said Juan Lorido, who played on Dowd's final two teams. "He definitely made me a better person and a better tennis player." Dowd died in the early morning hours of Saturday March 2 at age 81. His life will be celebrated at the Church of the Resurrection in Burtonsville, Md., on March 26 at 10:30 a.m. In speaking to people about Dowd, a portrait emerges of a funny, witty, caring man who loved his family and loved tennis. He was highly creative, knew how to bring out the best in others and made people feel good about themselves.